RADIATION PATTERNS, WHAT ARE THEY TRYING TO SAY ? AND WHAT CAN WE DO WITH THEM? The radiation pattern of an isotropic in free space. Free space is the world, without “earth or other things” there is nothing for an antenna to radiate or “bounce” against. This world does not exist. We often refer to “free space” as the biggest benefit is the fact there is nothing, there is also “nothing” that can influence our antenna. 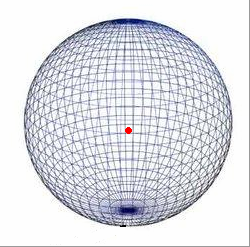 Lets say we have a single small spot which radiates in all directions equal in a free space environment. The antenna his pattern would look like the one above. We call such an antenna an isotropic antenna; this is an antenna which radiates in all directions equally. This antenna does not exist in real live. The shape of the pattern is similar to that of a round balloon or a “round” earth. antenna and one which is actually simple to construct. Above A dipole placed in ‘free space”. 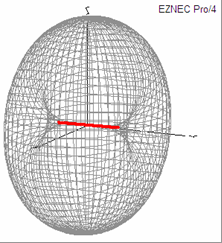 The red line indicates the physical location of the “dipole as you can see at the ends of the dipole the pattern is pushed inwards. Please notice, there is NO Round pattern anymore. The thing you need to realize is… If we start digging in the earth we collect rocks/sand etc...that’s something we have to put somewhere else. If we start to apply force on a balloon the balloon becomes smaller in one direction but bigger in another. That’s the basic of gain. Okay, the above omni-directional pattern of the isotropic and the “pushed Pattern” of the dipole both still in free space. From the dipole its point of view, it has gain (green) in reference to the isotropic. If we compare the gain to an isotropic we call it “dBI” if we compare the gain to a dipole it would be “dBD”. The I stand for isotropic and D for dipole. Sometimes you will see gain expressed just as “dB”. This is not useful. This doesn't show to what its compared. MOST IMPORTANTLY! THE DIPOLE HAS ALSO LOSS IN THE OPPOSITE DIRECTION! We are now at our first step of conflict. You will hear many people complain about false gain figures. You will hear people say gain should be expressed in dBD since that is the only “real” antenna we can compare to. … So “the devil” can come up with different dBD figures. It is known that we compare gain at the “maximum” points of both and at equal heights etc etc. But not all people/companies do that! LET US INTRODUCE THE EARTH ! At the above picture nr 1, we have placed the dipole above real earth. We might have noticed not only the “sides” are pushed outwards, from our beautiful round shaped isotropic pattern, but also the “top/bottom”…. YES, hold that thought! You are right! If the pattern is “more” pushed outwards…there must be additional gain somewhere else! And loss at an other point! My compliments, you have now learned, in real live (above real earth!) a dipole produces more gain than it does in “free space”. A valuable lesson which most people do not realize. The amount of this “additional ground-gain depends on the height above ground, polarization and ground circumstances. Most plots so far were nice 3D plots. But that’s not what we always see from our manufacturers. We often see plots like nr “4” and “5”. IF we look from the sky, down at our antenna the pattern seen won’t be a 3D anymore. Just a 2D plot. This is called the “AZIMUTH PLOT”. It's what we use with our rotator…”ill turn the beam towards you! You will move the azimuth plot of the antenna. The azimuth plot can be seen in picture 2 (the round circle) and picture 4. The azimuth plot contains 360 degrees. 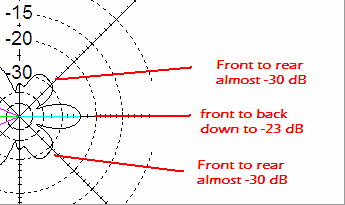 IF we look from the side to the antenna, the pattern we see is called the “ELEVATION PLOT”. This plot can be seen in picture 5. In real live the elevation plot is always 180 degrees as the earth is underneath the antenna “blocks” the other 180 degrees. We will investigate both plots to more detail! Back to the azimuth plot. We look from above, at the antenna…but remember, its 3d in real live. The pattern is not flat! Nr1 This is the maximum gain we have. Most of our power is directed in that direction. NR 2 These are the -3dB beam width points. The points where the gain has dropped with -3dB compared to the maximum gain number of the antenna. The beam width is expressed in degrees. If your beam width is really small you will need to beam very accurate! HOW ACCURATE SHALL I BEAM? Well, 6 dB is one S-unit. 3 dB is 0,5 S-unit. With the above beam (a small 3elements) the -3dB beam width is 66,4 degrees. So there's either 33,2 degrees to the right and to the left before a station drops a half S-unit…. So if you ever hear a station with a small beam ( 3 or 4 elements) say that he is not accurate beaming towards you, he is a couple degrees off…let him know, you know better. Nr 3, in the above picture, is the front to rear. over the full 180 degrees! NR 4, in the above picture, is the front to back. WE LOVE TO SEE A HIGH FRONT TO BACK FIGURE IN OUR MANUFACTURERS ADVERTISEMENTS! But more importantly would be to know what the entire back of the antenna does. Most manufacturers don’t show antenna modeling plots. A good manufacturer should do this, in my opinion. In this case, the manufacturer could have advertised, front to back over 40 dB! in the above yagi. Most costumers are only interested in the front to back figure! But if we take a closer look at the second yagi. We notice the front to back of this one is only -23 dB but the front to rear lobs are down to almost -30dB. You may be the judge, of which you find a better “back” of the antenna. maximum of -13 dB (compared to the maximum gain direction). You will often read stories about first side lobs when it concerns stacking. Stacking for maximum gain produces very large first side lobs. It might sometimes be wiser not to stack for maximum gain but just slightly below, so you will have smaller side lobs. We don’t want side lobs cause they brings in “other stations” as well. First a quick reminder. The elevation plot was when we were looking at the side of the antenna. 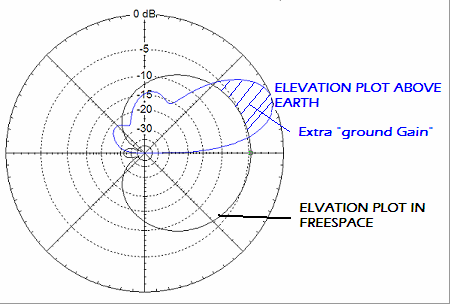 In the above plot you can see two “lines” one would be the free space elevation plot (the black line) and the blue line indicates the “real elevation plot” as we use in our daily life. Again we notice above real earth there is additional “ground-gain” In this case the blue pattern has maximum gain at approximately 24 degrees and is 11,75 dBI at that spot. The free space gain of this antenna is only 7 dBI. So the “additional ground gain in this case at a 24 degree angle would be 4,8 dB. And now back to the elevation plot. The elevation plot has a couple highlights of interest. The -3dB BEAMWIDTH is equal to the azimuth plot but now from a “sideward’s” perspective. In the above picture the “main” force was at a 24 degree angle and 11,75 dBI. The bottom pink line is at 11,4 degrees and since it is a -3dB beam width indicator the gain at 11,4 degrees is still 8,75 dBI!! There are “side lobs” (blue). In this case it is only a minor one, producing 13,84 dB straight up. If we had a high placed yagi or a vertical antenna you might have seen many more side lobs. In order to keep things straight I have picked one with minor side lobs. These side lobs are more or less equal to the ones in the azimuth plain. They are now seen from a “vertical” perspective. Side lobs can come in handy as well. First, maximum gain point. If we stand outside and take a look at the horizon the angle between earth and the angle we see is more or less 0 degrees. If we rise our point of view slightly upwards from the horizon (say looking at the sun a hours after sunrise) we have an angle between the earth and the point where at that specific moment the sun is. The elevation angle is almost the same. At some point we are looking towards the horizon… We adjust our spot slightly upwards…until we reach the point where the antenna produces maximum gain. The angle between the “earth” and that point is called THE TAKE OFF ANGLE. The abbreviation for take off angle is TOA. On 27 MHz the take off angle is often used with earth as one point and the angle of maximum gain at the other. It can however be that the take off angle is given from another “point”. In the above plot the TOA of the antenna is 24 degrees and the antenna produces 11,75 degrees at that angle. Above we have a 5/8 wave vertical at some height above earth. The TOA is only 8 degrees, and maximum gain at that angle is 4,35 dBI. At 11 degrees the antenna produces 3,74 dBI. Which was much lower compared to our yagi at relative low height. 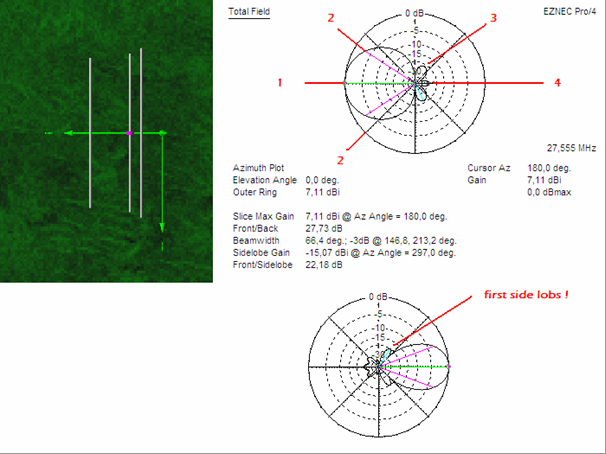 AN ANTENNA CAN HAVE A LOWER TAKE OFF ANGLE COMPARED TO ANOTHER, THIS DOESN'T MEAN IT HAS MORE GAIN AT THE SAME ANGLE! Why is the take off angle so important? Well, it determines how strong you are at different locations around the globe. On 27MHz the propagation forms we use most often are F2 and E-skip (sporadic E propagation). Around the earth there is a imaginary mirror reflecting our waves back to earth. My apologies for the bad drawing, but infact it is quite spot on, what is actually happening. At the left side we have a black vertical line which translates a transmitting position. At the opposite right there is a receiving point. Now the picture is “straight” but needed to be bend in order to reflect the “real” world…but for now we have work with this image The bottom black line represents earth's atmosphere and the blue bar is the imaginary mirror (F2 layer for example). I have drawn two “radiation angles, a red and a green one. We see that the angle between the green line and earth is small and the angle between the red line and earth is large. The red line needs to travel a much further distance in order to arrive at the location. This distance means loss. There for the signal will be much weaker and perhaps in real live not even audible. Imagine your transceiver without the coax connected…let’s wait for a moment…yes, actually nice isn’t it? The noise is low, no QRM no irritating noises, no QRM makers etc, etc. ENTIRE ANTENNA PLOT WHICH BRINGS IN THOSE NOISES. And now, I won’t have to explain a lot. Imagine if we had no side lobs, imagine if the -3dB beam width was really small, and imagine a world with a fabulous front to rear. What would that bring us…..yes…less noises more change to work DX!